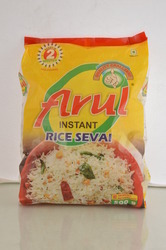 Leading Manufacturer of rice sevai from Chennai. Introducing our 2 minutes ready to eat Rice Sevai for a healthy lifestyle. It is easy to cook and healthy to eat. Owing to our tremendous experience of more than five decades in this domain, we offer pristine grade Rice Sevai. Available in several packaging options, this Sevai is prepared using quality-assured rice and other ingredients under the strict supervision of our ingenious food experts. Provided sevai finds its wide consumption in hotels, homes, restaurants and other related places across the globe. To ensure its quality, this Rice Sevai is also stringently examined on various quality aspects.